I recently wrote a short blog post about illegal mist nets in China. In that post I expressed optimism that the practice of trapping and killing birds might be slowly dying out in China. Shortly after I wrote that post, a Swedish birding colleague based in Tianjin discovered up to 2km (!) of illegal nets in a large reedbed at Beidagang Reservoir, supposedly a nature reserve. This sparked an outcry from local birders and, with the help of Chinese birding friends in Beijing and Tianjin, these nets have now been photographed, the details reported to the local authorities and those nets that were reachable have been destroyed. Birders with experience of ringing birds in similar habitats in China have provided a rough estimate of the number of birds that might be killed in nets of this scale. One explained that, in a typical 3-hour morning period, you would expect to catch and ring 50 to 60 birds in three lines of mist nets with a total length of 250 meters. If we use these figures, and simple math, to estimate the impact of the illegal mist nets at Beidagang Reservoir, we reach a total of 400 birds per day. However, this is clearly a minimum as the ringing data is based on only 3 hours of peak activities in the early morning. The real number could easily be 600 or more per day for 2 kms of mist nets that are in place 24 hrs a day. Going further, if we consider a migration period of 3 months, this gives a total of 55,000 birds that could be killed every year in this single line of mist nets. If there are 20 places like this along the chinese coast (which is undoubtedly a conservative estimate), the total quickly multiplies to 1 million birds killed every year during autumn migration. This is simply unacceptable. Shi Jin, a Beijing-based birder, has had enough and has started a new initiative to publicise this illegal activity. A dedicated web page has been set up, in Chinese and English, with the purpose of highlighting and shaming those involved. Readers are encouraged to send in photographs and short texts about their experiences. Already several contributors have uploaded some shocking images. At the same time, there has been outcry on Chinese social media networks this week after a video was published by undercover journalist Li Feng from Changsha Evening News showing how hunters in Hunan Province are using lights to lure in migrants at night before blasting them with (illegal) guns. You can view the (disturbing) video here. It is encouraging that this illegal activity is now receiving public attention and the reaction of ordinary netizens has been overwhelmingly hostile towards the perpetrators. By building public awareness and increasing the pressure on the police and local authorities to put a stop to this practice, there is a chance that this disgusting and illegal activity can be eradicated. If you have any examples of illegal bird trapping in China, or would simply like to offer your support to this campaign, please visit the site and either upload your experiences or leave a comment. Let’s keep up the pressure to help save these wild birds. 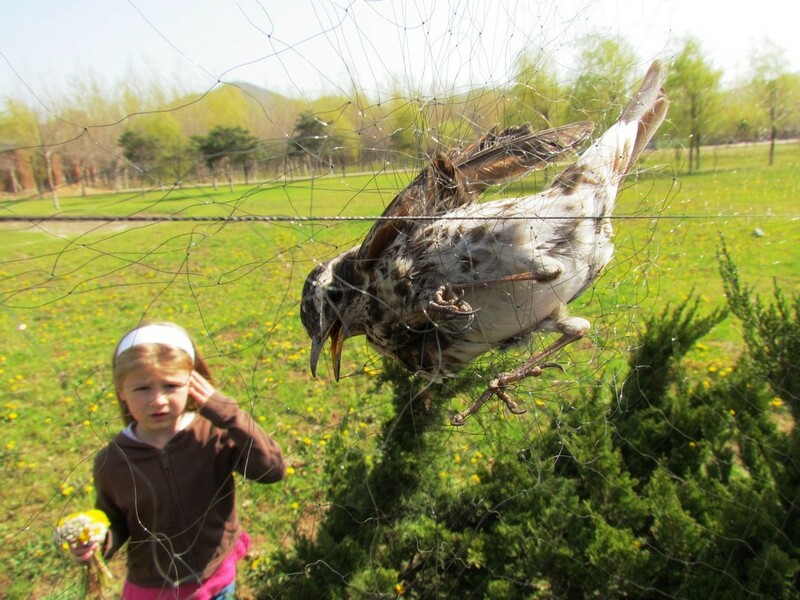 Finding birds in illegal mist nets is distressing. This image was taken near Dalian, Liaoning Province. Photo copyright Tom Beeke. An illegal Great wall. I have to quote a conversation i had with a shop-keeper in bird market here in Shanghai. When i asked him about a Verditer flycatcher, he said the birds were from Tianjin, i thought he was lying keeping in mind the distance between the two places and the cost involved to transport them but seeing these evidences Tianjin can supply birds to the rest of the country. Thanks Dev. Very interesting! Not sure Verditer Flycatchers are regular in Tianjin.. sounds a little fishy. But certainly the birds from Tianjin must end up somewhere to be sold and I am sure many end up in south China where the trade is much more common. This is a great initiative and like you say Terry, I think the trend is in the right direction. Younger people have less interest in trapping birds and, for a certain section of society, more reaction to the cruelty involved. But I believe that the laws relating to mist netting, or trapping, are not clear. Not all mist netting is illegal. Clearly it should be so in nature reserves and if it involves protected species. But it was only quite recently outlawed in Beijing for trapping songbirds and it seems to be legal if it is for protection of crops, orchards and the like (fishponds?). Not to mention the widespread use of extensive nets at airports. It would be good to get some clarification on this. You are right, Spike. There are clearly some circumstances where trapping birds remains legal and it is important to have clarity on that. Clearly, as you say, netting in reserves and wild areas is illegal but, in some agricultural fields or orchards, it may be legal. If anyone can clarify this, please comment on here. Thanks. Hi, Terry. I am an undergrad here in Tianjin, and a friend offered me the link to this post. I am very happy to learn that there’s a website to, at least, do something for the birds. So I am very eager to share the story and the website with our Tianjin college environmental circle and junior birders, to see if we could gather our effort to make a difference. Here I am asking for your permission to translate the post into Chinese and publish the English and Chinese versions on other social networks such as renren and weibo. Thank you for your comment. It is great to hear from you. Of course, I would be delighted if you were able to translate my post into Chinese and publish on Chinese social networking sites.. The more publicity we can generate the better! Please let me know what response you receive.